Back in the late 1990s and early 2000s, Australia was beset by foreign miners buying up its gold mines. Big names like Barrick, Newmont, AngloGold Ashanti and others seized on smaller, mid-tier Australian companies, gobbling up the country's best assets. But over the past few years that trend completely reversed. Gold's price retrenchment saw miners surrender billions of dollars in market cap. Many were burdened with huge piles of debt. Some held mines that carried high production costs. Others simply wanted to raise cash as a buffer. In any case, gold mining heavyweights from North America and South Africa raced to unload their non-core assets in places like Australia. That opened the door for mid-tier Australian miners to reclaim their mines at bargain levels. In a little more than two years, 14 Australian gold mines and 23% of Australian gold production changed hands. Foreign companies' ownership of Australian gold production dwindled from more than 70% to less than 50%. And so the mid-tier Australian gold mine sector entered a new renaissance. Another trend fanned the flames of that resurgence — one that made Australian miners still more profitable. I'm talking about currency divergence. Indeed, the U.S. dollar has gotten stronger over the past three years, as the Federal Reserve ended quantitative easing and began pushing interest rates higher. The Australian dollar, on the other hand, has gotten weaker. In fact, it's fallen about 30% against the greenback since 2013. This is good for Australian miners because they pay costs in the weakening Aussie dollar, but receive payment for gold in stronger U.S. dollars. 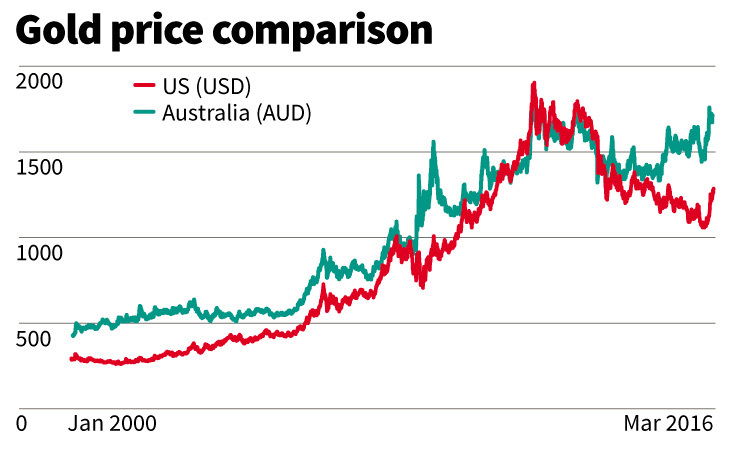 Almost shockingly, the Australian dollar gold price is only about $100 less than the all-time record. So while many international miners continue to labor under heavy assets and the stronger dollar, Australian miners are better capitalized. And while international miners are shrinking, Aussie miners are expanding. Data released by the Australian Bureau of Statistics recently showed national gold exploration expenditure at a two-and-a-half year high of $138.2 million. That's up a staggering 70% from the 14-year low seen in mid-2014. I'm sure you see now why Australian mining stocks are so prized. Newcrest Mining is Australia’s biggest gold miner, with operations in the Asia Pacific and West Africa. It uses a variety of efficient mining methods for large ore bodies. The company projects 2.4 million ounces of gold production this year. Its group AISC is $762 per ounce, with its best-performing mine, Cadia, producing at just $182 per ounce. Two others, Bonikro and Gosowong, have AISC of $680 and $686 per ounce, respectively. In total, the group has about 28 years of reserve life left. In Newcrest's last fiscal year, it generated a $546 million profit and cut its debt by 22%. That's been a huge relief for the company, which was at one point fairly-heavily indebted. Newcrest's low costs and favorable currency dynamics have brought the company strength. So much so that it's generated 10 consecutive quarters of positive free cash flow. 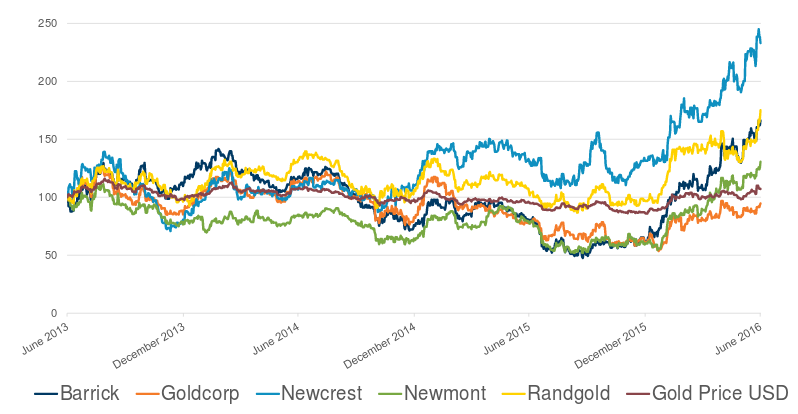 As a result, Newcrest has soared in valuation over the past three years, from less than $6 billion to $16.5 billion — and that's without any large-scale additions to its asset base. In fact, Newcrest recently sold its half-stake in the Hidden Valley mine in Papua New Guinea to South Africa’s Harmony Gold. Newcrest stock pays a dividend of 7.5 cents per share. Oceana is much smaller than Newcrest; but then again, so are its costs. Oceana's AISC was a sector-low $709 per ounce in 2015, and that's expected to fall even further to just over $600 per ounce in 2017. Gold is currently trading at twice that. Its 2015 gold output was 419,153 ounces compared to 307,463 in 2014. This year, production is expected to be between 385,000 and 425,000 ounces, with AISC of $700–$750 per ounce. Indeed, 2016 is shaping up to be an even better year for Oceana. The company reported in April that it'd hit record production in the first quarter. Total gold production came in at 122,782 ounces, with record quarterly gold production of 46,811 ounces from its Didipio mine in the Philippines. OceanaGold was one of the companies that took the opportunity to pick assets off of its competitors over the past couple of years. The miner made a big splash with its $101 million purchase of Newmont's Waihi mine New Zealand. The mine has performed well, too. However, it should be noted that while the gold produced at Waihi is cheap (AISC of $650 to $680), the mine is going to reach the end of its life in a couple years. Oceana, of course, is aware of that and has taken steps to replenish its reserves. Oceana took advantage of the gold price slump to absorb new assets. The company acquired Romarco Minerals Inc. in 2015. This increased Ocean's debt burden, but not overwhelmingly so. And the takeover is expected to add attributable production of 540,000 ounces gold in 2017 at an AISC of just $533 per ounce. 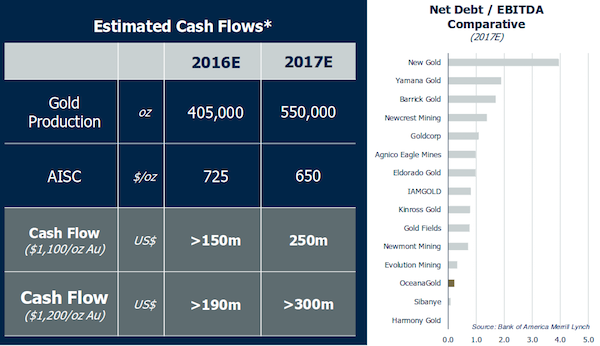 In short, OceanaGold is looking at a couple years of very strong profits, with the potential to improve long-term production at very low all-in costs through exploration and new mines. The company is valued at about $2.5 billion, and that's with a 67% increase over the past six months. The stock also pays a $0.05 dividend, which yields 1.25%. That's pretty good for an industry that doesn't have a lot of cash to kick back to investors at the moment. Northern Star was one of the first Australian miners to move on assets. In just six years, the company has become 100x more valuable — its stock rocketing from just three cents per share in 2010 to more than $4 per share today. The company bought the Plutonic mine from Canadian gold giant Barrick Gold in December 2013 for $25 million. It was called a “screaming deal” at the time. And in August, Northern Star flipped that mine for $66 million. Now, the company is focused on its four concentrated operational centres of Kalgoorlie (the Kundana and Kanowna Belle mines), Central Tanami (a joint venture), Paulsens (acquired in 2010), and Jundee (which it picked off of Newmont for $82.5 million in 2014). Given those assets, Northern Star forecasts production of 485,000oz to 515,000oz for the 2017 financial year. That's at an all-in sustaining cost (AISC) of $1,000/oz to $1,050/oz. And the company aims to grow its annual production rate to 600,000 ounces in 2018. 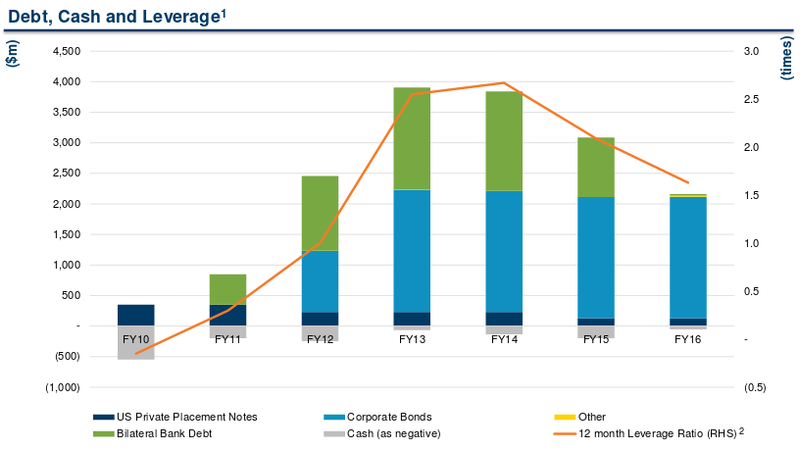 Northern Star has no debt, and cash and cash equivalents of $326 million, up from $178 million a year ago. And that's after spending $11 million acquiring the Central Tanami project, paying $36 million in dividends, and investing $50 million in exploration. In fact, the company is increasing its exploration budget by about 20% to $62 million. Beament isn't lying. Northern Star has done an amazing job taking advantage of industry dynamics. It's taken the post-crisis gold bust and turned it into a boom. The same goes for Newcrest and OceanaGold. All three have outstanding prospects for the years ahead.